Attending the ‘Reading Scars’ event tomorrow (Sunday) at World Literature Weekend (London Review Bookshop) along with Hakan Nesser, Karin Alvtegen is a Scandinavian author who had, so far, escaped my radar. A while back there was a television adaptation of Missing starring Joanne Froggatt (from Coronation Street) which I missed, not realising it was based on this hit novel (Shortlisted for the CWA International Dagger). Having now read the novel, I want to seek out the adaptation, which strangely seems only available on Region 1 format. Sibylla Forsenstrom is a 32 year old woman who appears to be running from a dark past and is trying to score a free meal and a night at hotel when we first join her. Things are going fine with her chosen male of the evening, Jorgen Grundberg, although we are given glimpses of her past and the reasons for her being an outcast and rumours that in 1985 she escaped a mental hospital, which set things up nicely for what transpires later. And then, and this is a crime novel after all, Grundberg is found murdered, Sibylla is already on the run again and is the prime suspect, her face and description appearing in all the papers. Sibylla seeks refuge with friends from her past, changing her hairstyle and appearance, visits her mother and then continues to run and hide as the press issue news of a second killing, this time a 63 year old man in his cottage. Both murders are described as ritual executions by the press with comment that the bodies have been mutilated and organs taken. In many ways it’s the murders that set this book apart from most crime novels as they are off camera and we’re rarely anyway near the crime scenes or the investigators. Sibylla asks her old friend, Thomas, to go to her post office box and get her savings for her, to help her continue to stay on the run, but when he returns empty handed she doesn’t know whether to believe him that her mother may have taken the cash or if he has robbed her. Her world appears to be collapsing and not for the first time. She has been let down before, flashbacks to her past reveal her discovery that her boyfriend, Mikael Persson was caught cheating on her and then the reason for her solitude and state of mind are brought to the fore as the revelation that she had a baby when she was younger and it was decided by others that the baby should be taken for adoption. She reveals her past to a young man, Patrik, who visits her and brings her food to her latest hiding place and he suggests to her that they should seek out the real killer for themselves – little by little they start to piece together something that just might lead to the capture of the real murderer. Beyond the names and the geography of the novel, this is a story that could take place anywhere and with themes that are universal, those of loss and of dealing with loss. 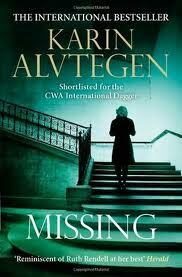 It’s a race against time novel, concentrating firmly on the central character rather than the crimes for which she is accused and, if this is an indication of Karin Alvtegen’s work, then I shall certainly be seeking out more.